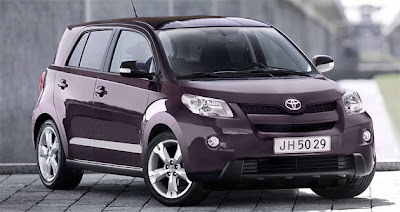 What do you call a Scion xD in the UK? You call it the Urban Cruiser. Essentially the same vehicle, there are some differences for the UK market. First off, the Urban Cruiser has a different (and arguably better looking) front fascia than the Scion xD. It also comes standard with 16" alloy wheels. That's about it for the outside. On the inside, the UC features optional satellite navigation and push-button start/stop, too. Here's where things get interesting: The Urban Cruiser offers Toyota's Intelligent All-Wheel-Drive system with a 1.4-liter D-4D diesel engine and "Optimal Drive," which is Toyota's engine start/stop technology. Cool, eh? Oh, by the way, this AWD diesel gets 57.6 MPG. Where do I sign up? The UC is also available with front-wheel-drive and a gas-powered 1.3-liter DOHC mill with dual VVT-i that gets 51.4 MPG. Granted these MPG figures are probably for the New European Driving Cycle (NEDC), so they're a bit higher than the U.S., but they're still impressive, nonetheless. A diesel-equipped UC with a manual transmission, AWD, and standard features will run about £16,400 GBP, or a whopping $26,341 USD. Auto prices are always higher in the UK, though. Thanks to Yaris World's "Kaotic Lazagna" for the story idea! I really like it,it looks sharp in that deep purple color.I think it will have to dazzle European car shoppers because they have several cool 4 door superminis already like the Fiat Grande Punto,Peugeot 207,Daihatsu Materia,Suzuki Swift,and the Mercedes-Benz A-Class.Also I don't understand why Toyota is marketing the xd/Ist/Urban Cruiser as a crossover(a dubious term imho) to Europeans when its bones are all car.Nevertheless I think it will find an audience with some of the practical folks who like the "square cut" styling as opposed to the cute egg shaped/insect-like styling of the Vitz/Yaris and Fit/Jazz.